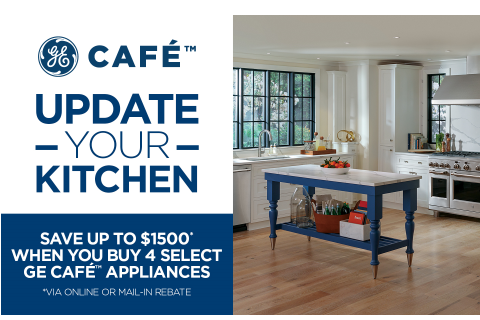 Buy 4 GE Café Appliances and get $500. Get an additional $500 with a Pro Range or Wall Oven / Cooktop Combination. Plus an additional $500 when you add a built-in refrigerator. Valid until 12/31/2018. Shop model included in this rebate! Via online or mail-in rebate. Cards are issued by Citibank, N.A. pursuant to a license from Visa U.S.A. Inc. and managed by Citi Prepaid Services. Cards will not have cash access and can be used everywhere Visa® debit cards are accepted. This card is a Visa® prepaid card. Each time you use the card the amount of the transaction will be deducted from the amount of your available balance. Terms and conditions apply to the card. Visa® rebate card will expire 6 months after issue. No additional fees will be assessed once the card balance reaches zero. Cards can be used at merchants that accept Visa® debit cards.